I just attended my first SXSW and I got everything wrong. But even if you get everything wrong at SXSW, it’s an experience you cant’ help but love, and hey, there’s always next year. First things first: if you’ve never been to SXSW, it’s not like a huge park with 2 or 3 stages and the acts rotate through while you decide in which field you’re going to sit. Instead, it’s as if all your favorite bars and music venues in the world relocated within a one-mile radius (give or take…someone out there was probably wearing a pedometer). In those 100s of venues, 1000s of bands can play 40-minute sets over the course of 5 days, and they will. Beyond bands all over town, SXSW is a music conference too. And it’s held in an actual convention center, with panels, keynote speakers and other showcases. Most attendees either purchase a badge, which allows access to all venues that are official (and is meaningless in the unofficial ones) and gives you the privilege of reserving a hotel room in the city; or a wristband, which is cheaper and has second-class citizenship compared to badges. Both can get you admittance to all official venues, but the badges will be admitted before the wristbands. There are rumors of some wristbands never getting into really hot venues, but I didn’t hear that happening this time. Some venues will admit those without a badge or a wristband for a cover charge, but not all will. If you have a big honking camera and you want to bring it to night shows, get a credential. That’s a badge for your camera. People will hate you when you wave your camera with its shiny badge around to get the front to take your pictures, but hey, that kind of full-body contact is why you wanted to be a photographer, right? Anyway, during the day, everyone’s much more cooler about your big honking camera but at night…look out. Do music research beforehand. Find out which of your already-favorites will be there and decide if you are going to see them and how often. Then decide who are your new “must-sees” and plot out when you’ll be able to fit them in. In a third category, add those bands you’re curious about but won’t regret (you hope) not seeing. Look out!!! 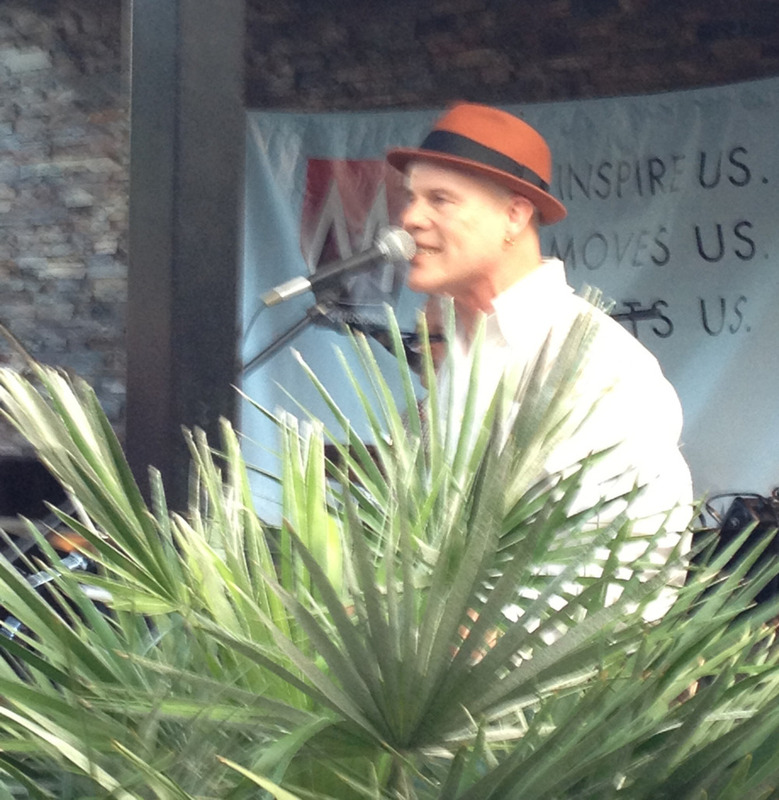 Thomas Dolby may lurk around every bend at SXSW!Day strategies are different from evening strategies. Day venues are more open (that is, shorter lines), and stocked with a greater number of freebies. Such as beer. Line up your experiments, your maybes and your curiosities for day shows. Save your sure (or surer) bets for the night showcases. A lot of people had the strategy of not seeing bands that you’ve seen before, but I’ve decided that’s counter-intuitive for me. Sure SXSW is a great chance to see all-new music, but the reason I like the music I like is that it gives me a warm fuzzy inside each time I hear it, and frankly, I want that sure-thing warm fuzzy as much as possible. So next year, I will go see more favorite bands even if I’ve seen them a few times. For me, that would be something like the Cults and Best Coast. After you’ve made your plan, start planning your back-up plan for when a band or venue just doesn’t work out. While the “conference” provides a massive book of the shows, venues, and conference panels, you will likely not want to carry this around. I had hand written notes, just in case my battery died. And it did. Every single day, after about six hours’ use. This always led to a retreat to my hotel around 5 and was a direct cause of me missing most early (7 pm) bands as my phone recharged. Document everything on a social media site like Facebook or Tumblr. Obviously, you’ll want to make your friends jealous in real time, but you’ll also have a way to track where you were the next day. There is no need to see Youth Lagoon twice, simply because you forgot you’d seen them already. Get an external charger for your phone. Buy a case of water for your hotel, and a stack of granola/energy bars. Keep a friend on retainer via text who can make on the fly suggestions about course corrections. With that out of the way, let’s move on to the music..
Caveman @ SXSWThe first day -- Tuesday -- was spent at Guero’s Taco bar for Music OVRLD, a local Austin showcase put on by the friend of a friend. I definitely felt I’d arrived, drinking my Lone Star beer and enjoying the sounds. My highlight was a band called the Hi-Tones. I headed back to the city to hear Caveman at the Bat Bar. Outside, I ran into a friend who was on his way to catch a few more bands, and he’d picked up a few people, so I took off with them. In quick succession, we saw Light Asylum, and Miike Snow, but we kept moving. 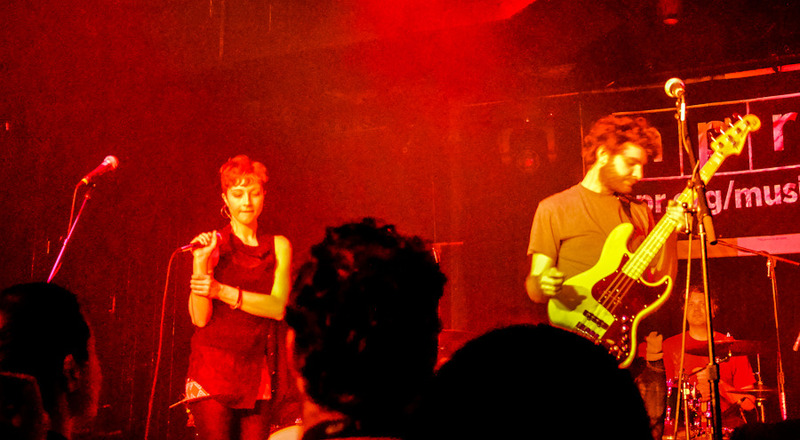 I ended the night back in the Bat Bar, watching POLICA shimmer across the stage and a sad wasted boy fight with the wall, which refused to let him fall to the ground. Wednesday started with a free beer and a bit of serendipity. A nice sound was coming from the Paste showcase, so I went in to see MYNAMEISJOHNMICHAEL and was handed my free beer. I loved their noon energy, but especially appreciated the horn section. I felt obligated to visit the DC showcase since I’d not seen any of the bands, and knew the organizer, so I headed over to catch Pree, who are almost too precious, and had my coffee. A quick dash from that bar took me to see Cincinnati’s Seedy Seeds. I don’t know how I came to hear about this band, but a friend’s friend is from Cincinnati, and that was enough for me. This was my first SXSW exposure to crazy multi-instrumentalists. A banjo? And an accordion? And what else? A fiddle? They had a merch table so I bought a CD. Turns out the guys from the band were sort of hungry so we all ran out to grab food. Austin has tons of vegetarian options, but almost no one I met expected to actually meet a vegetarian. I found a crepes truck and got them to make me a spinach and mozzarella crepe, which I ate on the go, heading over to the Warby Parker showcase on the other side of 35. Yes, I wanted sunglasses, yes I wanted to see the French Legation Museum, and yes, there were bands. This time it was another Merge showcase and just as I did through out SXSW, I caught the tail end of Hospitality and a bit of the Love Language, who I had seen before. Then I headed back under the 35 to see The Wedding Present at Red Eyed Fly. I’d only seen them once and wondered how they’d be a second time, and they rocked it out. Wednesday evening was a mad-dash. Starting with the Young Evils, who charmed an entire bar and part of the street. Then off to Stubbs for the NPR showcase with Sharon Van Etten set . I’ve never been too enthralled with Fiona Apple, so I missed her set. Ran across town for the Australian band, Oh Mercy, passing Thomas Dolby on the way, long enough to hear “Airhead.” A dash back to Stubbs (used my SXXpress pass) for the Alabama Shakes, whom I found to be “good” but not to my taste. A dash from there brought me to the ND club, where Lower Dens was playing. I’d seen them a few times, but liked their music enough to add it to my yoga playlist, but they played nothing I knew, and nothing that caught my ear like their previous album. I headed back to see the Cults, but my battery was dead and unfortunately never quite made it. Tune in tomorrow for part 2 of Suzanne's report on the magical musical mayhem that is SXSW, and click on the image below to see the rest of Suzanne's shots from this years SXSW. You'll never be as prepared as these guys.